NEW YORK, NY--(Marketwire - February 9, 2010) - NETworks Presentations, LLC and Blue Man Productions are pleased to announce a new theatrical touring production set to premiere in the Fall of 2010. Although Blue Man Group has toured previously with its Megastar arena rock show, this marks the first theatrical production of their show to tour North America. The theatrical tour will feature classic Blue Man moments as well as brand new content that will delight audiences and fans young and old. Tour cities and dates will be announced soon. Blue Man Group on tour will also feature a new physical design that centers around a proscenium-sized LED curtain and high-resolution screen to create an entirely new visual experience for Broadway houses across the nation. 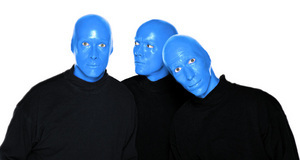 The critically acclaimed Blue Man Group creates experiences that defy categorization. Blue Man Group is best known for multi-media performances that feature three bald and blue characters who take the audience on a journey that is funny, intelligent and visually stunning. Blue Man Group is accompanied by a live band whose haunting tribal rhythms help drive the show to its unforgettable climax. "NETworks is thrilled to produce this tour," says NETworks CEO Kenneth H. Gentry. "Blue Man Group complements our touring roster by adding a new level of entertainment with its combination of theatricality and multiple-medium performance art." "People may ask why it's taken more than 20 years for us to mount a theatrical tour," says Blue Man co-founder Matt Goldman. "The answer is simple: We wanted to get it right. As we prepare to bring our show to new audiences across the country, we needed to make sure we incorporated all of the knowledge we have gained over the years to make the most entertaining and emotionally powerful production ever." NETworks Presentations, LLC was founded in 1995 by Kenneth Gentry, Seth Wenig and Scott Jackson, NETworks has produced and managed over 70 national and international touring productions. Previous productions include "Oliver!," "Little Women" starring Maureen McGovern, "Jekyll & Hyde," "Kiss of the Spiderwoman," "Cinderella" starring Eartha Kitt and Deborah Gibson, "Fosse" starring Ben Vereen and Ruthie Henshaw, "The Light in the Piazza," "My Fair Lady" co-produced with Cameron Mackintosh, Rodgers and Hammerstein's "Oklahoma," "Matthew Bourne's Swan Lake," "Sweeney Todd, The Demon Barber of Fleet Street," among many others. Joining returning hits "Annie," "The Drowsy Chaperone," "Hairspray" and "The Wizard of Oz" this season are "Disney's Beauty and the Beast," "Young Frankenstein," and the Lincoln Center's production of Rodgers and Hammerstein's "South Pacific." Future titles include Joyful Noise's production of "Handel's Messiah Rocks," "A Chorus Line," "Spring Awakening," "Les Misérables" and the Blue Man Group national tour. Blue Man Group is best known for its widely popular theatrical shows and concerts that combine music, comedy and multimedia theatrics to produce a totally unique form of entertainment. The blissful party atmosphere created at the live events has become the trademark of a Blue Man Group experience. Currently, Blue Man Group theatrical shows can be seen in New York, Boston, Chicago, Las Vegas, Orlando, Berlin and Zurich with the re-opening of the Japan show scheduled for spring 2010. -- Blue Man Group family-focused educational projects, including a touring Children's Museum exhibit, "Making Waves"